The child star who began her cinematic career appearing with Judy Garland in an MGM two-reeler has passed away. Deanna Durbin shared screen time with Garland in Every Sunday Afternoon, and it served to become a screen test for the two aspiring stars. Following a screening of the short for MGM executives, opinion was divided on whether Garland or Durbin would be retained. Louis B. Mayer, upon his return from a European trip, decreed both girls should be kept. Between 1936 and 1947, she recorded over fifty tunes for Decca Records. Re-creating her movie songs for commercial release, Durbin also covered top standards of the day. Her hair, makeup, and on-screen outfits set fashion trends worldwide, and were emulated by millions. Winston Churchill said the actress was his favorite star. Another of her fans was Anne Frank, who posted Deanna’s picture to her bedroom wall in the attic where the Frank family hid during World War II. The photo can still be seen there today. Her film credits include Christmas Holiday and Stranger on a Train, when she wasn’t cast in minor “B” musicals. She was actually famous for having her studio turn down famous roles. And, she also refused parts that she arguably would have been fabulous in. These productions include Oklahoma and My Fair Lady (on Broadway), A Connecticut Yankee in King Arthur’s Court, and the film versions of Kiss Me Kate and The Student Prince. Over the years, Durbin made it known she didn’t like the Hollywood studio system. She never identified herself with the public image the media created around her. 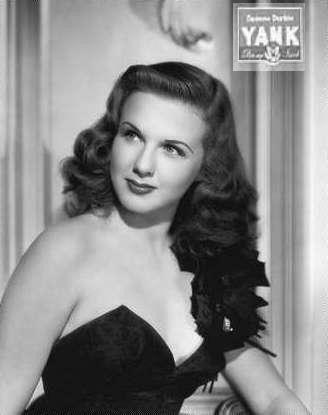 She often spoke of the Deanna persona in the third person, and considered the Deanna Durbin cinematic character a by-product of her youth, and not her true self. She steadfastly asserted her right to privacy, which she maintained until the end of her life. This entry was posted on Wednesday, May 1st, 2013 at 3:01 am	and is filed under Blog by Manny Pacheco. You can follow any comments to this post through the RSS 2.0 feed. Responses are currently closed, but you can trackback from your own site.